Tagging feature is very popular among Facebook users where your name can be tagged to specific post, photo or publication on Facebook. With newer Privacy Controls, you can now selectively and manually approve, remove or reject tags related to your Facebook profile on specific post or photo. This is possible using all new “Tag Review” feature on Facebook. Once you enable ‘Tag Review’ feature on your Facebook profile, then anytime a friend wants to add a tag to a photo or post you make, that tag won’t appear until you approve it. Hence, you can approve and control which tags are ok and you can get rid of tags that you do not like. 1. 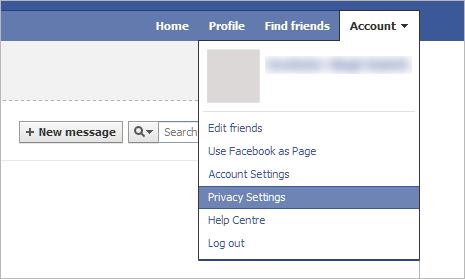 After Facebook login at facebook.com website goto Account > Privacy Settings option. This will open Privacy Settings webpage with title “Privacy settings – Control Privacy When You Post”. 2. Scroll down and look for “How tags work – Control what happens when friends tag you or your content” option. Click Edit Settings button to view Tagging options for your Facebook profile. This will open “How Tags Work” box with options like: Profile review, Tags review, Profile visibility, Tags suggestions and Friends can check you into places. 3. Click Off Setting next to Tag Review option, this will open “Turn On Tag Review?” box. Click Turn On Tag Review button at bottom right of this box. 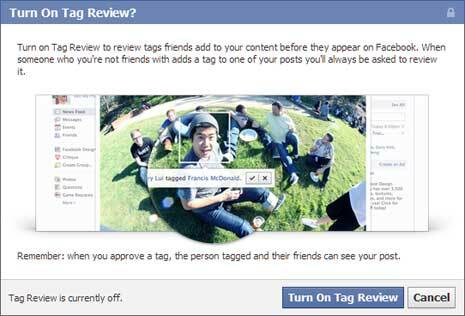 This will enable Tag Review feature on your Facebook profile. From now on, when someone who you are not friends with adds a tag to one of your posts you will always be asked to review it. 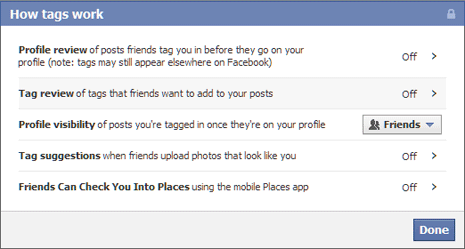 Also, once you approve a tag, the person tagged and their friends can see your post.